Get ready for next year of wizarding at Hogwarts! We'll provide all the tools, supplies and instruction to build your own authentic-looking Ollivander's-style wizarding wand. For ages 10 and up; younger children must have the assistance of a parent or guardian because this project requires the use of a low-melt hot glue gun. Kids, teens and adults are encouraged to attend and to come in early enough to allow at least an hour to work on your wand. Join the fun on Wednesday June 7 from 10:30 a.m. - 4:30 p.m. No pre-registration required; available while supplies last. 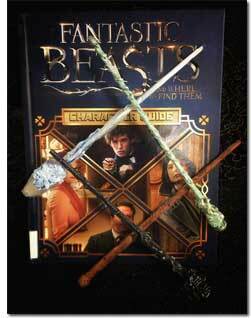 Pictured are examples of wand designs, along with the book 'Fantastic Beasts & How To Find Them: Character Guide".